Lightstone Properties has acquired a portfolio of four car dealerships in Bradford and York in what has been billed as the biggest sector deal since Brexit. It includes centres operated by Pendragon and Vertu Motors. The assets were sold by CBRE on behalf of Kennedy Wilson Europe Real Estate and include Land Rover, Citroen and Hyundai franchises in Bradford, and Peugeot and Citroen businesses in York. Comprising a total of 75,678 sq. ft the assets provide secure income of £660,698 per annum, with an average unexpired term of 10 years. 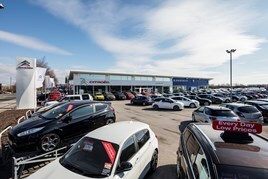 Adam Chapman, head of Knight Frank Automotive team, said: “It is the second largest car dealership portfolio to transact this year, and the first significant automotive deal post-Brexit. “These are prime assets let to strong operational tenants with excellent short and long term asset management opportunities. Dan Dempsey, at CBRE, which acted on behalf of the vendor, said: “This transaction continues to demonstrate the strong demand for well let, secure income investments throughout the automotive sector. The centres in the deal are York Peugeot and Citroen and Bradford Citroen, operated by Pendragon, Bradford Land Rover, by Vertu - under the Farnell brand - and Bradford Hyundai by Cars 2. The biggest transaction this year was Jardine's acquisition of Colliers Motor Group in June for £17m.